If you are unfamiliar with charts, the lines on each chart are for different periods as indicated by the legend at the bottom of the chart. 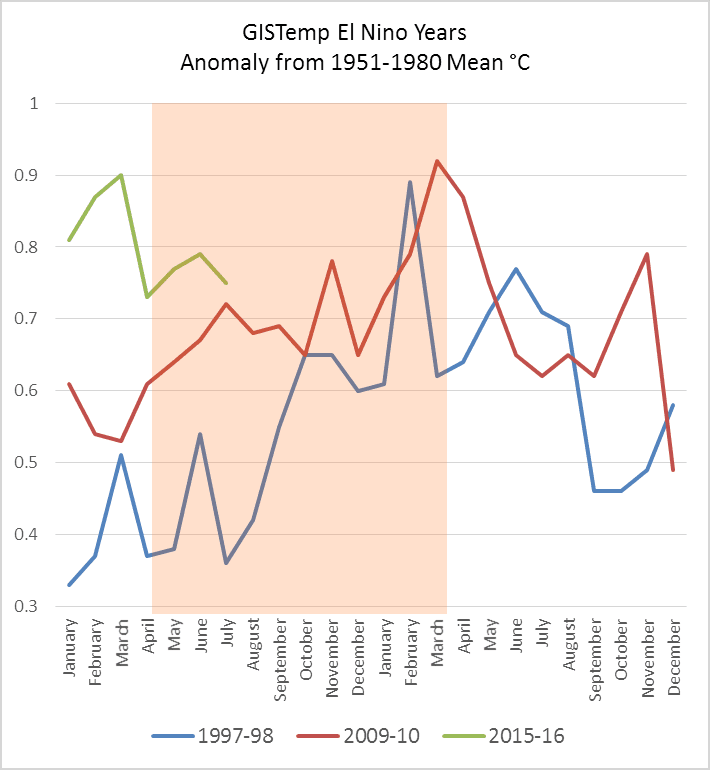 The charts show the temperature anomaly for each month from January in the first year of the El Nino to December of the second year of that El Nino. 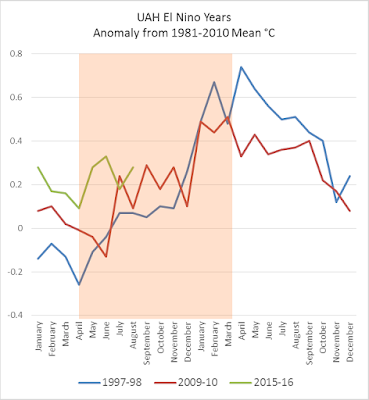 What you need to look at is how the temperature anomaly climbed as the El Niño progressed in each period. That is, how the temperature anomaly rose in the later part of the first year of the event (October to December) and early in the second year (January to May). We are still in the relatively early stages of the current El Niño, although it is now considered "mature". The major impact on temperature anomalies is probably yet to come. 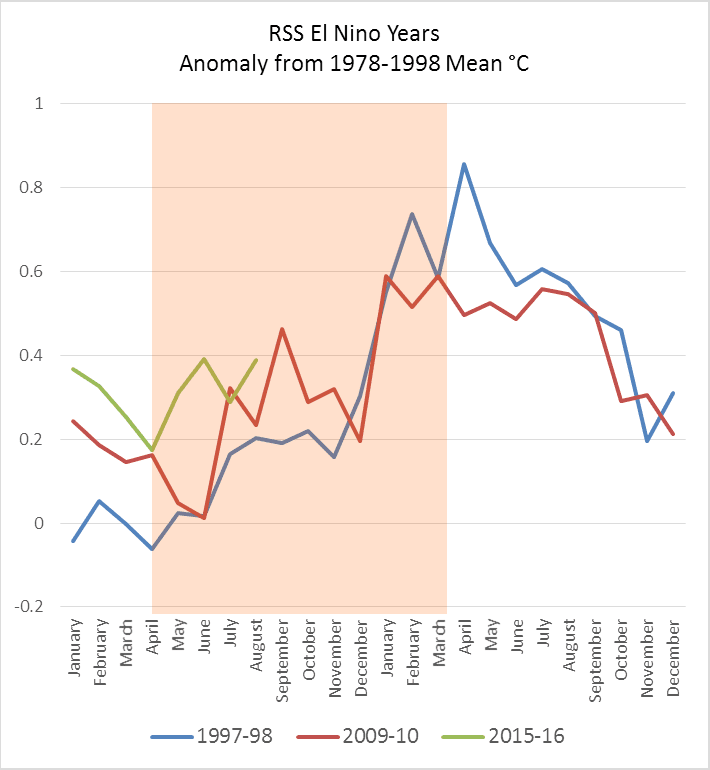 All the charts show that in 1997-98 and 2009-10, the maximum anomaly was reached late in the El Niño or, in the case of the lower troposphere for 1997-98, after the El Niño finished. If this El Niño has the same effect on the temperatures of the lower troposphere and at the surface, then Christopher will probably have to restart his count going back to zero. He would definitely have to start his count again from zero if the RSS anomaly shoots up enough over that of 1997-98, which it may do. Imagine the WUWT articles then: "It hasn't warmed since 2016", which might last him till 2020 if he (and we) are lucky, though it just as likely won't - if we have entered a warm phase of the PDO (see below). In his latest "it hasn't warmed since" article, Christopher wrote hopefully if mistakenly: "However, the year or two after an el Niño usually – but not always – brings an offsetting la Niña, cooling first the ocean surface and then the air temperature and restoring global temperature to normal.."
The chart also shows the phases of the Pacific Decadal Oscillation (PDO). This is a pattern of sea surface temperature in the Pacific Ocean and is described by an index. It shifts from what is called a warm phase to a cool phase over decades. 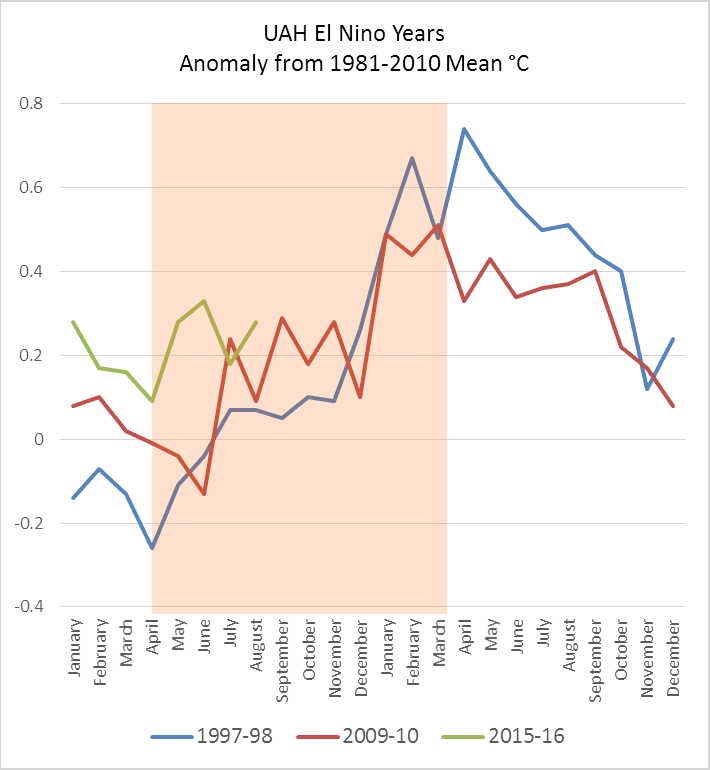 As you can see, when the PDO is in a warm phase, El Niños tend to dominate. In a cool phase, La Niñas dominate. If we have already entered a warm phase, then none of us, including Christopher, are likely to get much relief from the next La Niñas. Even in the cool phase when La Niñas dominate, since around 1999, each one has usually been warmer than the previous. It's called global warming and we are causing it. I did notice somewhere that Monckton was trying out the new framing, that "the pause" is the difference between model projections and observations. He is a slimy toad, so he is bound to try something so he can keep cranking out his nonsense, and keep his patrons happy. I had noticed that the satellite observations leveled out after the 1997/98 El Nino. It is from 2000 that the climate models diverge from the observations. It is temping to think the El Nino had something to do with it, but it might have been a coincidence. It will be interesting to see if it happens again next year or not. I've seen other deniers try that one, too, Harry. I have a feeling that won't last very long either. On a month to month year to year basis it might work for a bit. Bob Tisdale is always complaining that climate models model climate instead of what he wants, which is weather. On the timeframe of climate change I expect the modeled projections will continue to be pretty close to observations. And then there are the projections of climate science deniers, which are way, way off beam. They veer off in the opposite direction to observations to a remarkable extent. Going to be kind of hard for anyone to call that a 'pause' (though I'm sure they'll try). I was only referring to the satellite measurements. They do not show much warming since around 2000. Although the result is not statistically significant, they are very noisy measurements. When Monckton and his ilk compare models to actual temperature they invariably use satellite data from the lower troposphere. We all know that. But what do models like CMIP5 actually try and model? Is it land, land+sea, lower troposphere or something else? There are CMIP5 experiments that cover all of the above and much more I think. Eg ocean heat content, sea ice, phytoplankton etc etc. We'll soon start hearing that nobody ever said there'd been a pause in actual warming, it was always about comparison with the models, and it will often come from people who believe it. It's the new truth, and always was, so there. As for the models, well, they're too crap to be worth comparing with, frankly. Have a Little Ice Age and relax. CMIP5 models include the three-dimensional atmosphere extending into the upper stratosphere or higher, around 35-40 km and above. The atmosphere is divided into multiple layers -- the fewest I'm aware of is 18 layers and the most is 80 layers (most are around 20 and 50 layers). So yes, the models include the lower troposphere but are not limited to it. You are correct that the ocean also is simulated in three dimensions, with a number of layers comparable to the atmosphere. The models include land processes, usually with around 5 or 10 layers within the soil, and sea ice. That we even have to mention his name shows how disfigured the dialectic has become. Apparently he was approached by a friend in the City of London wanting to know if 'this global warming thing' was anything to worry about and duly obliged with a polemic, backed up by the now familiar shonky references, including the Climate Audit Canard that the algorithm used in the MBH paper produces hockey sticks even when fed red noise. Christopher's sister, Rosa is married to Dominic Lawson who edited the ST up until 2005, which may or may not be relevant. Anyone in any doubt about his enduring lack of scruples need only look at the claim, repeated in the latest 'No warming for years' that 'In 1990, the IPCC’s mid-range prediction of near-term warming was equivalent to 2.8 Cº per century, higher by two-thirds than its current prediction of 1.7 Cº/century.' He has cherry-picked the most extreme one of 4 scenarios, (Scenario A) presented by the IPCC, one that had forcings greater than actually developed, his graph showing emissions on track for that scenario in a single year is equally cherry-picked, it is the cumulative concentrations that matter. IPCC Scenarios B & C turned out to be nearer the reality, both in terms of forcings and temperatures, but we can't have that can we? Thanks Phil. I didn't know he'd only been in the climate science denial game since 2006. It's a year longer than Anthony Watts. I checked FAR, given the claims in Christopher's latest article, that "In 1990, the IPCC had predicted near-straight-line warming of 1 K to 2025" and could not find any projections that stopped in 2025. Back in May with more time on my hands than usual, and the mods in permissive mood, I was allowed to engage with His Lordship at WUWT on this and other strands of nonsense, getting in two or three posts before the mods started disappearing my posts. It is in the thread about the Royal Society of Edinburgh. Lots of fun watching the pea disappear under the thimble as he twists and turns to avoid self-contradiction. 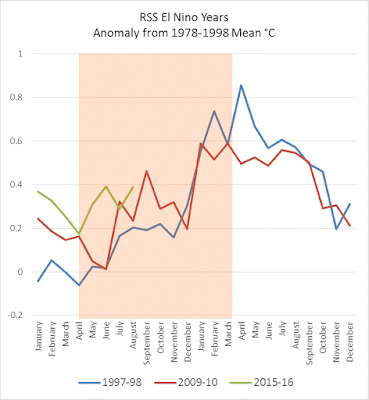 So Monckton's new law of trend analysis is that El Ninos are only allowed on the left hand side of the graph? Hmm... that's a bit sinister. Hmmm ... and a bit dextrous on fudging the results. R the Anon - boom boom! Of course, Monckton's pause is baloney. He finds the longest period, ending with the most recent datapoint, for which the slope of an OLS linear regression fit is zero or negative. His latest runs from Jan 1997. The idea that this is a pause is clearly bonkers - you just have to look at the data that Monckton *doesn't* show - the first half of the RSS series - to see how unreasonable the idea that global warming has stopped is. In that chart, the entire RSS series is shown. The green horizontal line is Monckton's "pause", the other lines are a linear fit to the entire data, with upper and lower bounds showing roughly the standard error of residuals. Unfortunately, because of the size of the 1998 El Nino temperature peak, Monckton's pause is pretty robust and it is going to require a substantial period of elevated temperatures to stop him being able to claim an 18+ year "pause" based on his spurious cherry picking. It's good to see him apparently getting worried though. I answer this "pause" of 18yrs., 19yrs, "nearly two decades" nonsense like this. If there has been no heating in that time, then there couldn't have been an heating since 2000, could there? However when you strike the line between then and now, it's showing intense heating. I love watching them trying to explain that. I have said before, by focusing on the pause they have set themselves up for a fall. Soon they will have to explain the weird situation of "no warming since 1998" but "significant warming since 1999". Idiots. Will they? We'll be seeing "significant warming since 1998" pretty soon. Then they can yammer on about the recovery and impending ice age since 2016 is so much cooler than 2015.
numerobis I think it will be more entertaining if the warming stays "non-significant" since 1998, since then we will have the entertaining prospect of "no warming for 17 years" but "warming over hte past 16, 15, 14, 13 years ..." That's going to be hard for the illiterati to get their heads around. Interesting that both mid-century temperature stasis and the recent "pause" coincided with the cool phase of the PDO. What is the mean contribution of an oscillation to a linear trend over time? It is zero of course! If one cherry picks short runs less than the half period of the sinusoid any sort of 'trend' can be found, both positive and negative. Here is a linear trend with sinusoid stretched to look a bit more like a real global temperature graph. If the data was more noisy we then have a series of 'pauses' to cherry pick from. It's interesting to consider what happened to temperatures during the last warm phase of the PDO. If the next one's not upon us yet it will be soon. Great post Sou. I had been wondering what sensible expectations of RSS might look like under El Nino, since it didn't seem to be moving yet, yet clearly seemed to respond significantly (seemingly more than the surface) during those past El Ninos. And thanks commenters for some of the other useful links. I predict that long after the 'pause' has gone, Monckton and his followers will still use it as an argument. They will say that during those 18 years they was no correlation between CO2 and temperature, so the enhanced greenhouse effect theory is proven wrong. - First, this el Nino will just be a 'blip' in the ongoing pause, especially if there is a la Nina event in 2016-17. - If it's blatantly obvious that the years from 2016 are warmer than 1998-2014, we'll have 'Pause II' starting this year. - The denialati will admit that warming is ongoing, and human caused, and we should really get our collective fingers out and do something. At a certain point in the not-too-distant future the only rational response to the likes of Monckton will be to ignore them. Geologists don't spend much time debating Creationists, after all. But of course it isn't a matter of scientific debate. It's the harmful political and public policy goals for which the Monckton and Watts style of disinformation is being generated and used that makes their debunking a necessity, at least until the time when all but the most venal or foolish politician feels too embarrassed to cite them.